Datatag, the market leader in equipment security and registration for business and domestic use, has announced the formation of a new Training Division. The new division has announced its first course, The Plant Theft Awareness and Identification Course, which is set for 13th and 14th November 2012. The 2 day course, which will be held in Gloucester, will appeal to a wide range of personal in the police and other branches of law enforcement, including roads police, PCSOs, SOCOs, police vehicle examiners and ports and customs officers. The course is designed to be equally beneficial to loss adjusters and engineers from the insurance sector. The new Datatag course has received accreditation from Education Development International (EDI). The aim of the course is to equip officers with the confidence and knowledge to stop, examine and deal with any piece of suspect construction or agricultural machinery effectively. There isn’t a police force in the country which hasn’t felt the effects of construction and agricultural equipment theft, by professional and opportunistic thieves, over the past few years and theft rates continue to rise. Since car theft has become much more difficult, without access to the keys, professional criminals have turned their attention to softer targets including construction and agricultural machinery. As Automatic Number Plate Recognition (ANPR) technology doesn’t work with this type of equipment the most effective agent to recovery, in the critical 48 hours after a theft is reported, is a confident and well trained police officer! Bespoke ‘in-house’ courses are available, by request, for specific constabularies to reduce travel and subsistence costs. 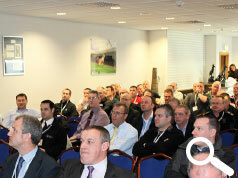 A full training programme for 2013 will be announced shortly that will include The Plant Theft Awareness and Identification Course at different locations around the UK and new courses designed for the police, other branches of law enforcement, the asset finance industry and the insurance industry. Course subjects will include tackling the theft of cars, vans, motorcycles, caravans and trailers and document fraud.